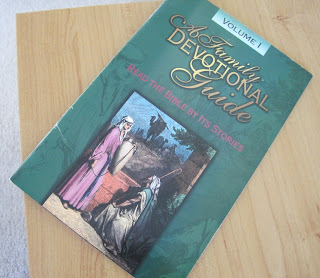 In the past, we have used a variety of books and resources for our family devotions. We recently began A Family Devotional Guide: Read the Bible by Its Stories (Crown Christian Publications). There are twelve volumes; each volume contains thirty-one lessons. Each lesson consists of a Bible passage to read, questions to answer and a weekly memory verse. Our children have grown up hearing Sunday School lessons, sitting in children’s church and going to Vacation Bible School. They attend a Christian school where they have Bible class every day and chapel every week. Bible stories have been read to them at home from the time they were infants. However, I appreciate this study because our children are actually hearing the words from the Bible rather than listening to the story told from a teacher’s perspective or put into the words of a storybook author. While they are familiar with the general theme of each story, interesting discussions can begin as the actual verses are read. As we studied Noah, our girls became interested in figuring out facts such as how long he and his family were actually on the ark. 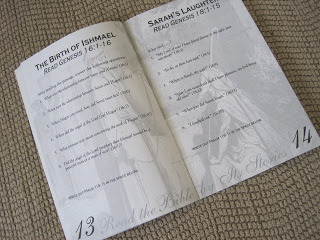 They also gained a new appreciation for just how old Abraham and Sarah actually were when Isaac was born! The included questions are helpful as well; it’s not just “who did what,” but asks for a little more explanation. Some of the pages offer a series of quotes and our girls have to tell us which person said that phrase in the passage. I am always excited about promoting Bible knowledge in our children, while at the same time having Bible characters be seen as real people just like them and giving them Biblical principles to apply to situations they are facing. How is your family studying the Bible? Thank you for sharing this book. I have been wanting to find a good devotional that the whole family could study daily together. Do you have a good suggestion for a good daily devotional for just my DD (9)? Or me, for that matter? 🙂 It could be books, or online material. I would love something that is a study, that has explanations as well. Unfortunately, I haven't had a lot of success finding a daily devotional for myself. In the past, I was part of a ladies' Bible study that read the book The Excellent Wife by Martha Peace and used the accompanying study guide which included questions to answer. It's not a "daily devotional" type book, but it was a helpful study. Our daughters are involved in Patch the Pirate clubs at church on Wednesday nights; that program includes a book which has a daily devotion for them to do. They basically fill in the blanks for a particular Bible verse, then read the accompanying section. It works well enough at this point. I hope as they get older to be able to find something else for them. I am currently looking for a Bible study that my nine-year-old and I could do together – something that would be beneficial to her as she grows into a young lady. I haven't yet found anything that I really like, but will certainly let you know when I do. For adults, there is "our Daily Bread" you could try (RBC Ministries, Grand Rapids, MI 49555-0001, USA) – they use NKJV, but if you're a KJV reader like I am, it's easy to look the verse up in your own Bible. Another one we use which I think is KJV only is "Choice Gleanings" (www.gospelfolio.com). That's an adult or older child daily devotion. Your study sounds interesting. We do a similar one called "Step into the Bible" and it has questions, and a scripture. I love hearing my kids get excited and ask questions about the Bible!